Ah, cheese! It’s an addiction for some, a passion for others, and simply disgusting to a handful of people too. And no wonder: frankly, there’s no need for humans to partake in the consumption of animal milks, and indeed, people in many cultures not only don’t eat it, but can’t tolerate it. 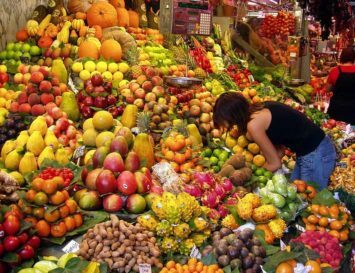 And yet…when people transit from vegetarian to vegan, one of the first things they often say they miss is cheese. It’s ok to indulge a little bit in this Western world favourite – but the key here is ‘a little bit’. Like milk, cheese does contain calcium, protein, phosphorus, Vitamin A, Vitamin B and many minerals such as zinc – but unless it’s organic, it’s probably also full of hormones, antibiotics, and traces of GMOs (which are fed to cattle). Remember that all cheeses are not created equally, either: goat’s milk cheese (aka chevre) has many advantages over cow’s milk cheeses. 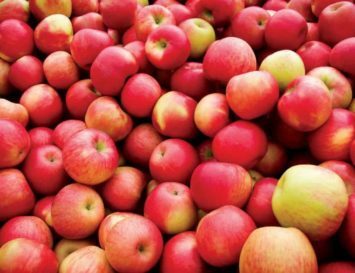 For one, it’s more easily digested and is non-mucous forming. 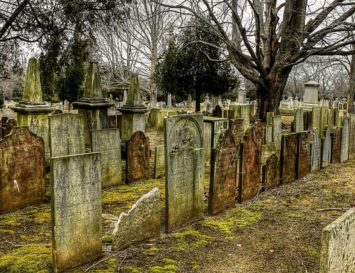 Interestingly, a scientific study done on people who had lived beyond the age of 100 showed one common denominator – all the centenarians regularly consumed goat’s milk. More good news about cheese is that milk contains tryptophan, one of the essential amino acids that can’t be manufactured by the body. The body produces serotonin from tryptophan – one of the chemical neurotransmitters responsible for wellbeing, good moods and healthy sleep. No wonder cheese is so moreish! The bad news is that lactose intolerance seems to be growing, meaning more and more people can’t digest the carbohydrates found in milk. If this is your issue, you should know that lactose is lower in ripened cheese and aged cheeses, such as Cheddar, Manchego, and Parmesan varieties like Parmigiano-Reggiano. 1. Cottage cheese: This unpressed cheese curd has a seriously low saturated fat content, yet is high in protein. 2. Quark: Another form of unpressed cheese curd, Quark has even lower fat and higher protein than cottage cheese and is now widely available in supermarkets. 3. Ricotta: Its low fat content means that ricotta is generally considered to be one of the healthiest cheeses: 100 grams of Ricotta cheese has around 5 grams of saturated fat. 4. Parmegiano Reggiano: This is a high quality Parmesan cheese that has a lower fat and lactose content than many cheeses due to the processes used in its production. 5. Feta cheese: Made from goat’s or sheep’s milk, this is lower in lactose and is thus better tolerated by more people. 6. 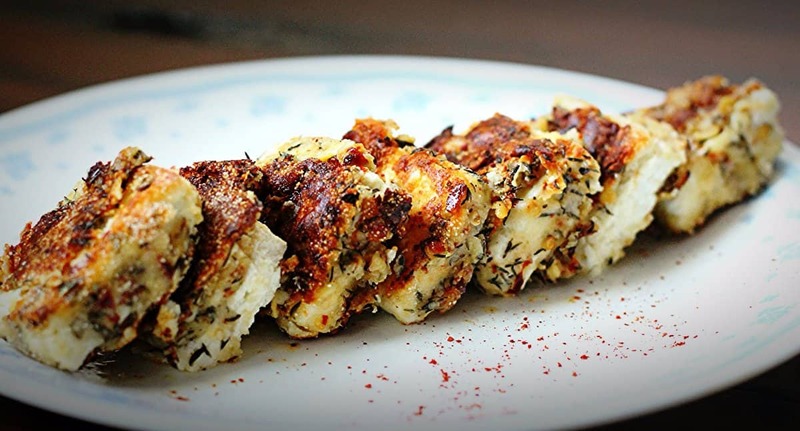 Halloumi: This Med favourite is low in lactose and made from goat’s or sheep milk. It’s also high in brain boosting Omega 3 and 6 oils. Just be careful, as this cheese also has a higher sodium content than most. 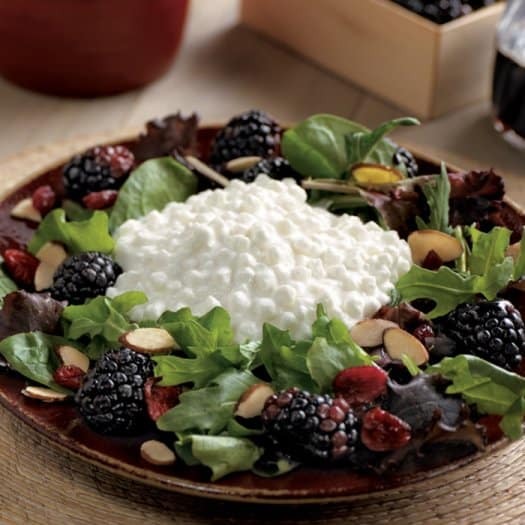 Many of the well known cheeses such as Brie and Mozzarella come in low fat or even fat-free varieties although many consumers complain that these really have little of the taste and texture of their full-fat varieties. As a general rule, hard cheeses have a higher fat content than soft cheeses, but cream cheese has high saturated fat levels. Cheddar cheese is also one of the biggest culprits where fat content is concerned, but then again, aged cheddars are low in lactose content, great for those who are lactose intolerant. The vegans amongst you are probably thinking: great, I can make these recipes, but just sub in vegan cheese instead! And of course you can. 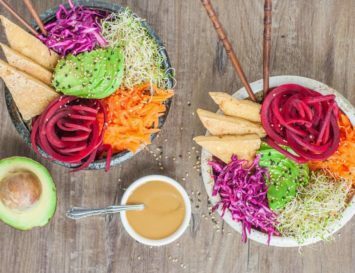 But just keep in mind that vegan cheese is pretty much junk food – most are made from processed oils, artificial flavourings and vegetable glycerin. Ick! 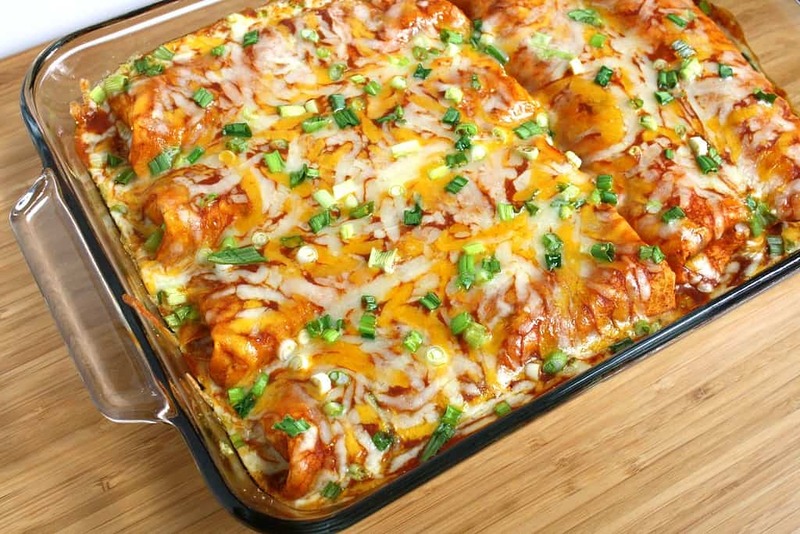 Ok, so now that you’re armed with that knowledge, let’s move on to some ooey, gooey, easy, cheesy recipes! 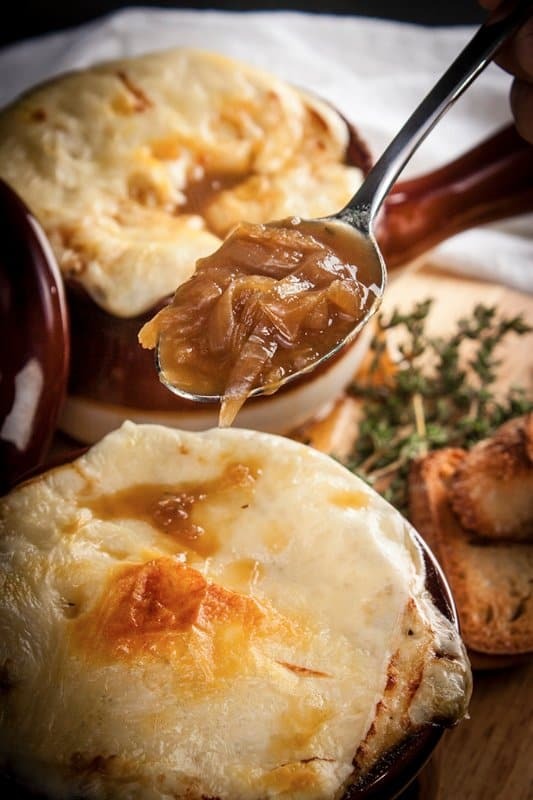 French onion soup is normally based on a beef consomme, but this version uses veggie stock instead. The salty broth, gooey cheese, crusty bread, lashings of sherry and a delicate touch of thyme all seem designed to delight the senses. 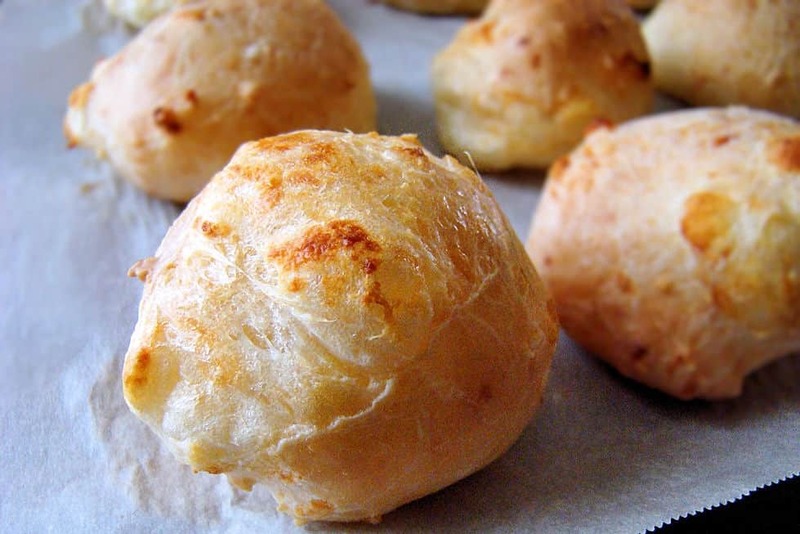 Pao Queso are totally addictive little balls of flavour that taste as delicious as they sound. You’ll find these served up at Brazilian restaurants, but save yourself the airfare and bake some at home. These are super-cheesy thanks to three kinds of cheese; mozzarella, feta and parmesan. Paneer is huge in India. It’s basically the most popular protein substitute for vegetarians. It’s a kind of soft cheese curd, and tastes extra special when there’s some crunchy spices on the outside, which is the case in this recipe. Serve it up with some rice, spinach and chutney on the side. People often complain that vegetarian dinners are boring. ‘What are we going to eat? A salad?’ is the typical whine when I invite non-vegetarians to dinner. 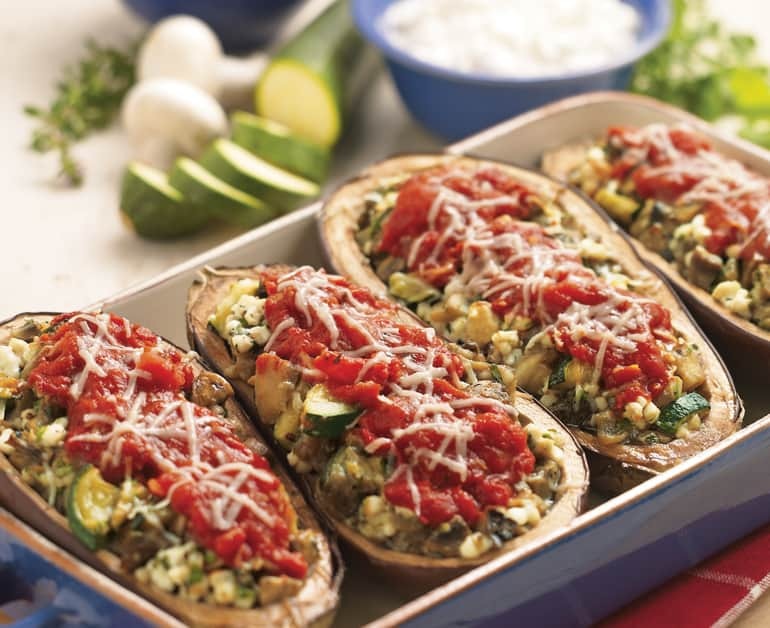 But these gorgeously stuffed eggplants will put a quick stop to those comments! 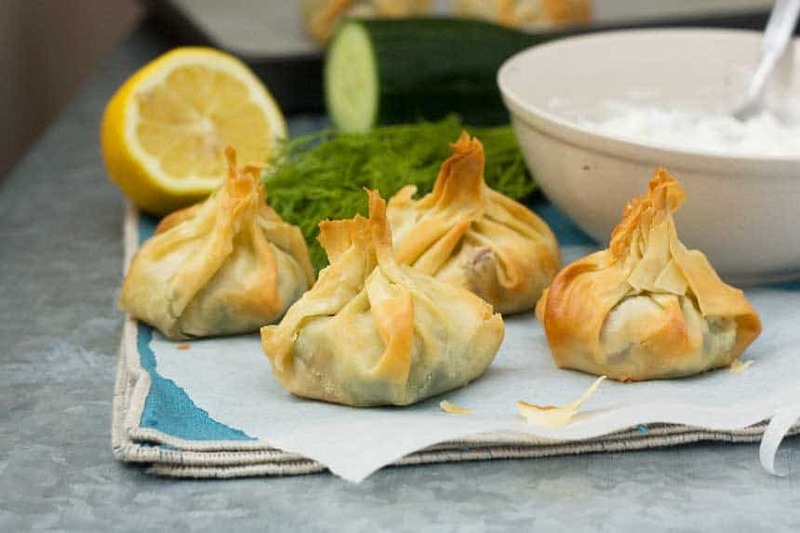 Tangy, creamy and healthy, these filling beauties look gorgeous beside a side of rice and salad. 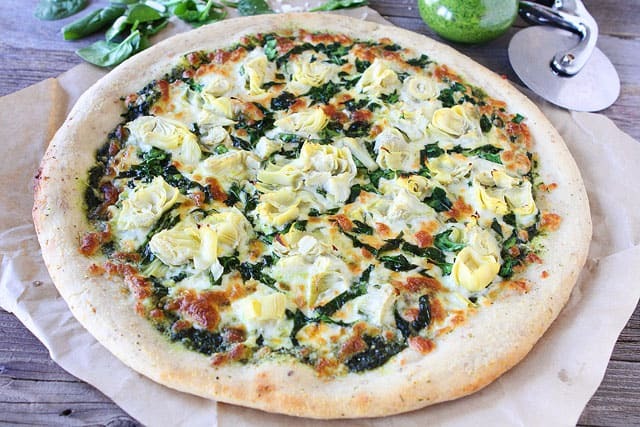 The key to a great pizza in my opinion is one with a thick, crunchy crust and lots of flavours piled in the middle which blend together to create perfection, like the spinach, pesto and artichokes do in this recipe. 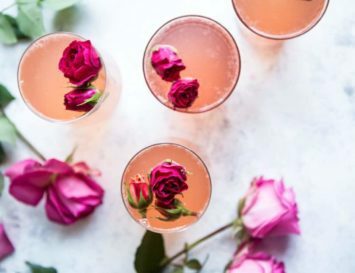 Best enjoyed with a side of wine and your best girlfriends. 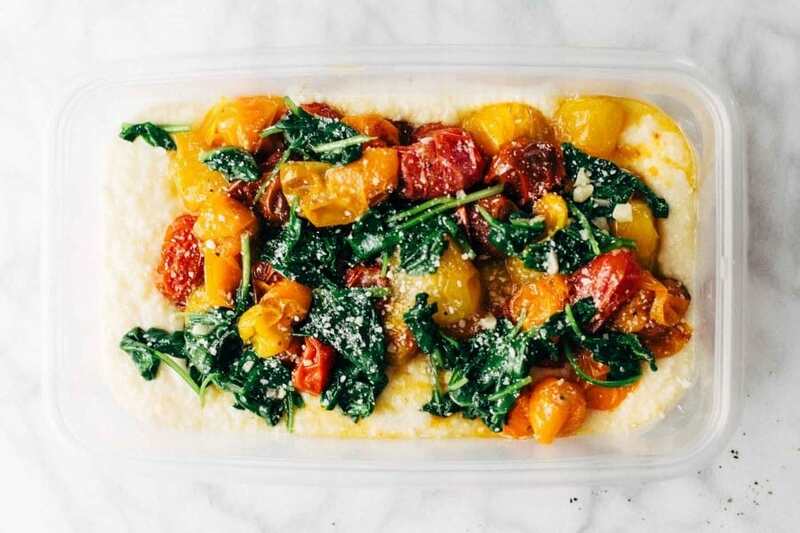 Polenta may be known as ‘peasant food’ in Italy, but the added goat’s cheese and heritage tomatoes here make this recipe a bit posh. No tomatoes on hand? Red and yellow peppers can easily be subbed in. Soup on a cold day is not only super comforting, it’s a great way to get your 5 a day packed in when a cold green juice just isn’t what you’re craving. 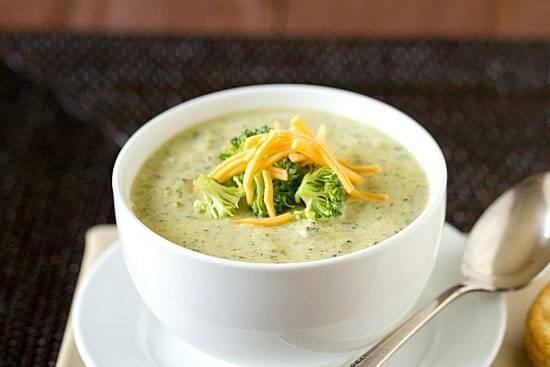 This is a great way of using up leftover broccoli into a warm and wholesome soup. It’s not a requirement, but I fully suggest enjoying with a warm, crusty roll. 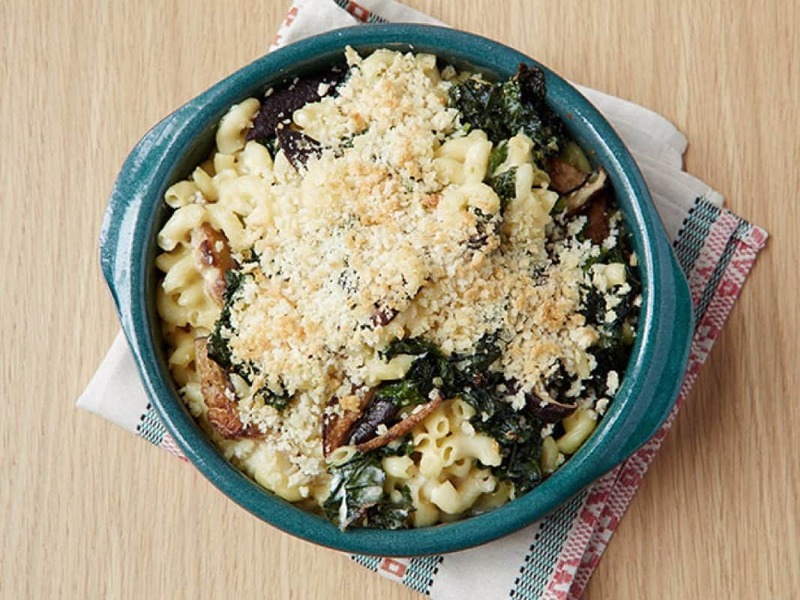 Mac and cheese is a family favourite, with its scrumptious lashings of creamy, cheesy sauce over pasta. But it’s never been known to be a healthy dish. Until now! Adding loads of kale and mushrooms practically make this a health food. Why not give this an added health boost by using whole wheat pasta? 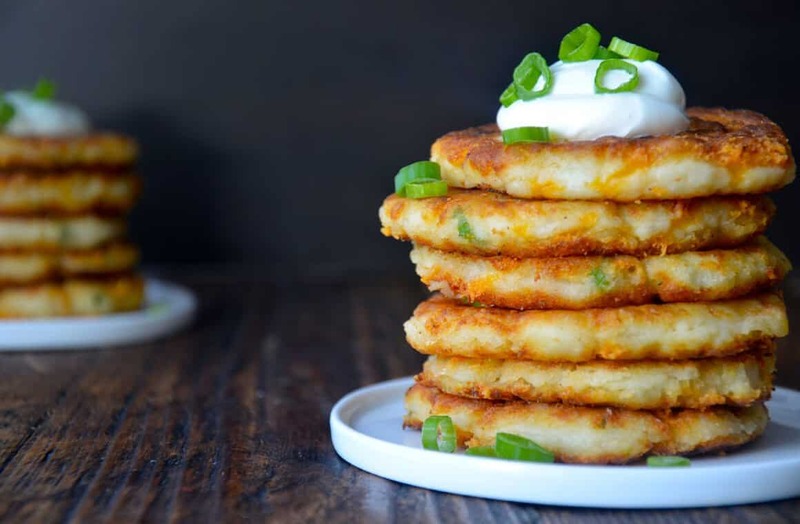 What’s not to love about hot, crispy cheesy potato pancakes topped with a dollop of sour cream and garnished with green onions? They use up your leftover mashed potatoes, and they’re super simple to make, too. 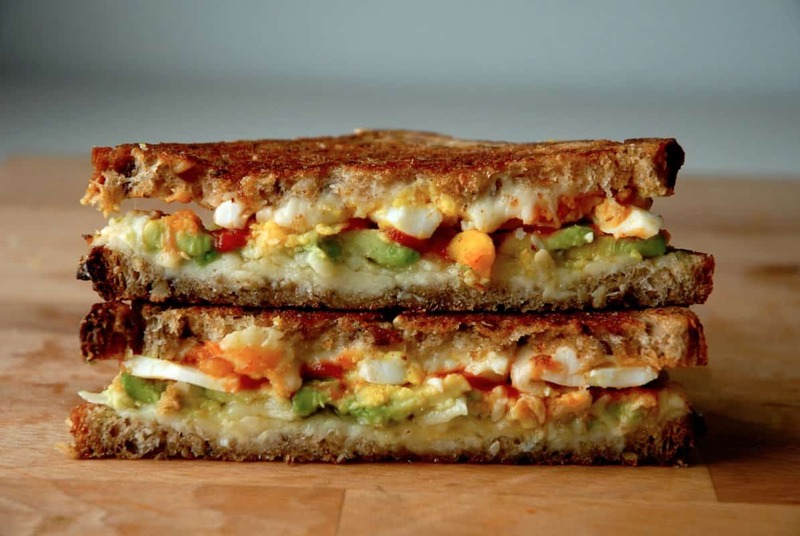 Serve in a stack and dig right in, for brunch, lunch or dinner! How pretty is this? It’s a dieter’s delight. It only takes 10 minutes to make, and only has around 300 calories, whilst being packed with vitamins, fibre and of course, calcium. Add lashings of balsamic reduction for extra sweetness if you’re feeling fancy. Halloumi is packed with healthy Omega 3 and 6 oils, but it’s saltier than most cheeses, so look for low sodium cheese. It’s most delicious when grilled to the point when it’s slightly blackened – try doing this on your BBQ in summer! The base of this recipe is a naan, so it’s almost like an Indian pizza. But these would be just as good on something like flatbread. 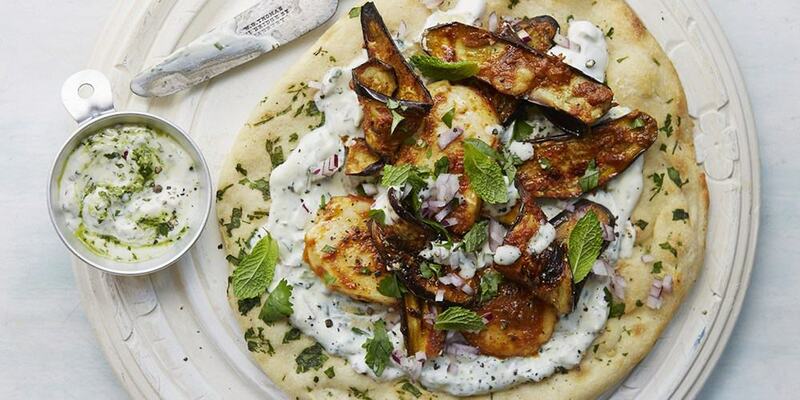 The halloumi is spiced with tikka masala and then topped with aubergines and the herbed yogurt which blends well against the hot halloumi. Feta is a pretty strong cheese and is often used in salad, typically a Greek salad. This is a little bit of a fresher take on the classic salad, with the addition of watermelon. You might be thinking: ‘Cheese and watermelon? Ew!’ But trust me when I say it just works. 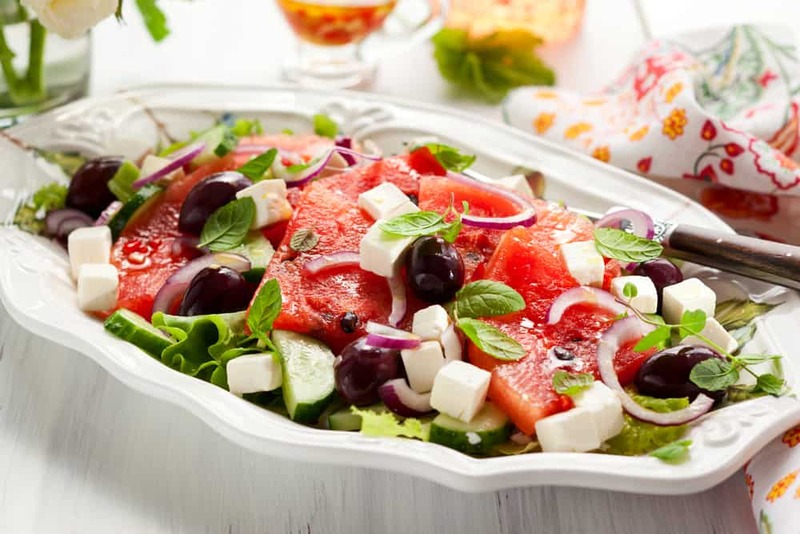 The strong, slightly salty feta is gorgeous against the salty olives and tangy onion and the watermelon will add just the right amount of sweetness. Souffles are notorious for being a little on the tricky side to make. Scrap that – they look almost impossible! 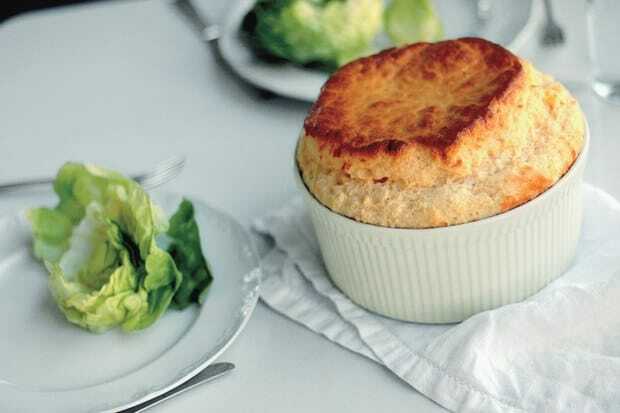 But I don’t think we’re being fair on the souffle, it’s really not as hard as it looks, especially with this great cheesy recipe. And if they do kind of flop a bit? Still taste the same! When you’re making a burger, you want something to really bite into, otherwise what’s the point? So when ditching meat something like portobello mushrooms have become a firm favourite, but if you’re not much into fungi, halloumi is another great choice. You can slice it to make thick chunks or thinner slices to suit your preference, and thanks to the jerk seasoning this burger is pretty big on flavour. The best part? This is so quick and easy to throw together. 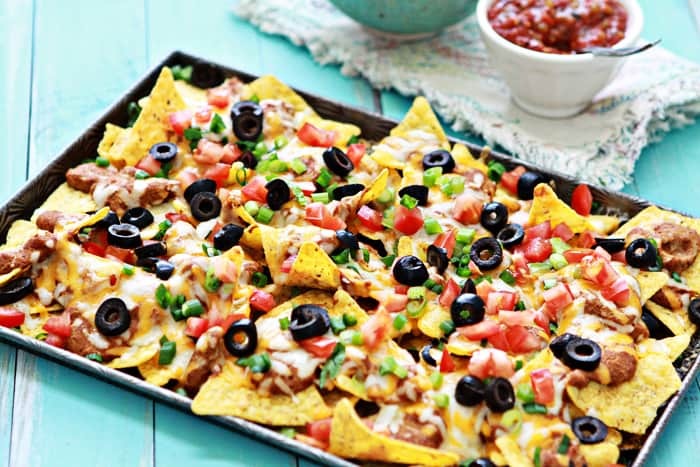 The thing I love about Mexican food is the variety of textures – crunchy, creamy, soft and gooey – and this recipe has them! There’s also a whole melody of different flavours. In short, this recipe is just as vibrant and tasty as Mexican culture iteself. When I visited Greece I had something similar to this from a bakery, every damn day. The scent of these drifting into the street was just irresistible! Feta cheese and pastry go perfectly together, especially when they’re fresh out of the oven, cooled off with a dash of tangy tzatziki. These potatoes are super easy to make – even a kid could do it! 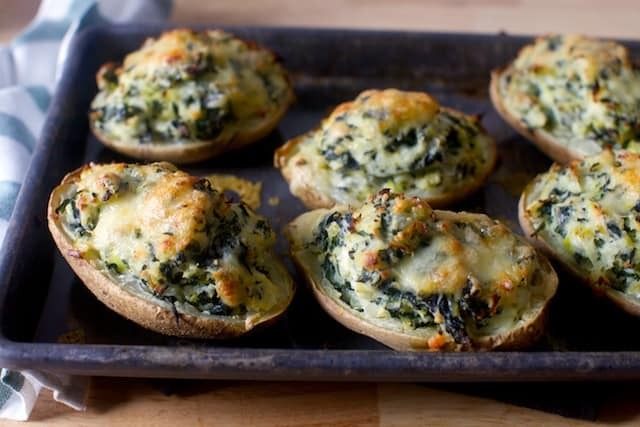 They’re first baked and then scooped out and re-stuffed with the addition of sour cream and topped with cheese and greens, and then popped back in to bake for a second time. The potato skins will go lovely and crispy, and the addition of the greens means they’re a bit healthier than a spud on its own. Why not serve these up with a leafy green salad? Avocado on toast is pretty much a classic healthy food now. 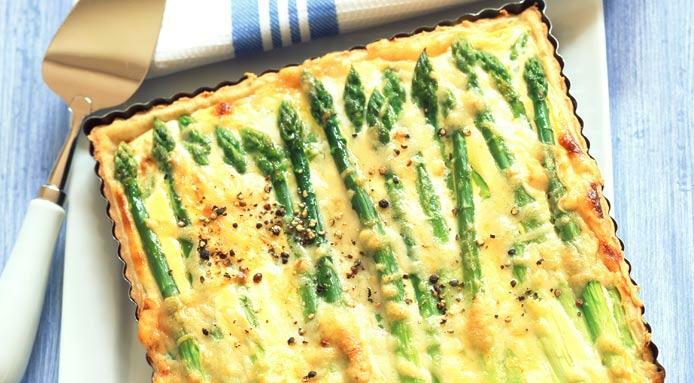 This is its slightly unhealthier vegetarian cousin – but doesn’t it look yum? Reduce the fat in this sarnie by using the whites of the boiled eggs only. And personally, my Brit palate can’t handle the red stuff here (it’s Thai hot sauce), so I just sub in good ol’ ketchup. Yep. 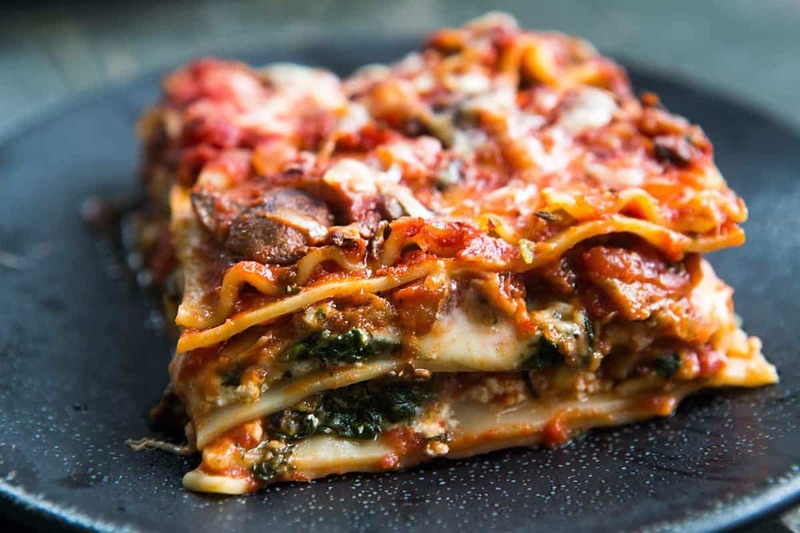 As Garfield has pointed out on countless occasions, lasagna is always a go-to recipe when it’s cold outside and you need something warm and filling. But whereas most lasagnas are laden with thick, creamy sauce, ground beef and lashings of cheese, this vegetable version, featuring spinach and mushrooms, makes it a little lighter and far more enjoyable. Friends coming over and no time to cook? Problem solved! Who could resist these crunchy, cheesy treats, especially when fresh from the oven? They’re basically a deconstructed bean taco. Super easy to make – you can even get the kids to chip in. In Argentina, empanadas are a national institution. Unlike empanadas from other countries, Argentina’s are baked, not fried, and their pastry is normally more ‘bready’ than the puff pastry you’d expect. They come in a limited number of varieties: humita (corn and white sauce), beef, chicken, and our favourite: spinach and cheese. These ones have a few added veggies in the way of green peas, making them extra-yummy. Bet you can’t eat just one! Oh, Italy. Thank you so very much for your contribution to food. And men. And architecture. And art. And fashion. Ok, back to food…These ‘dumplings’ are basically gnocchi, and melt in your mouth. They’re especially amazing with a homemade sauce: ignore the recipe’s advice to use commercial sauce and make your own! 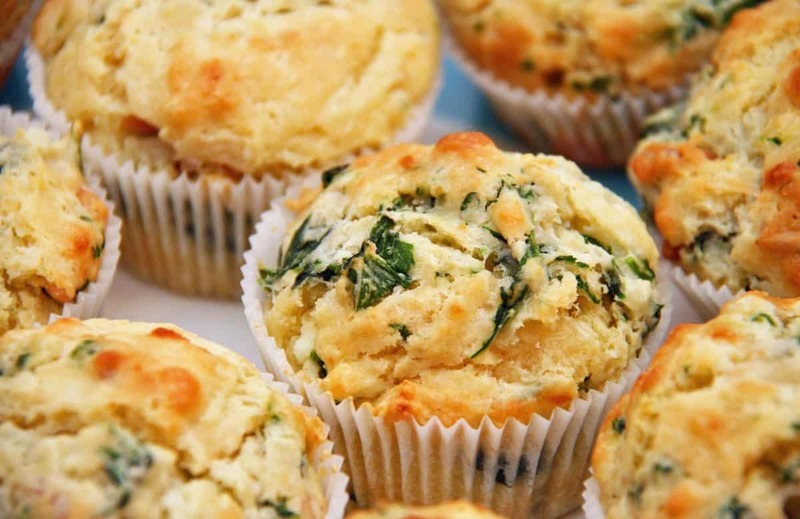 I love a muffin, but lately I’ve been more into savory foods than sweet, so these muffins are a great go-to when your sweet tooth has taken a back seat. 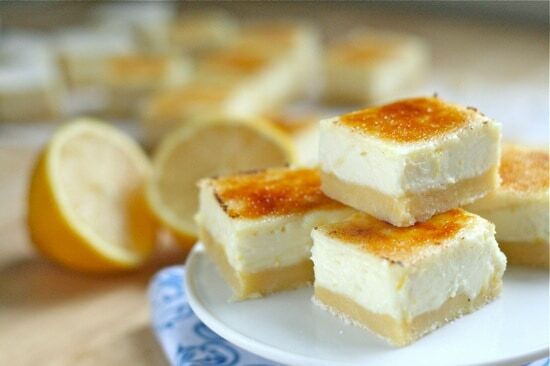 And these are great to make on a weekend ready for the week ahead as they’re so easy to make and then take on the go. Just throw a napkin and a muffin into a lock tight containers and you’re all set! Stuffed peppers are always an easy recipe for dinner when you’re not sure what to make. They’re even easy to make ahead for a portable lunch! 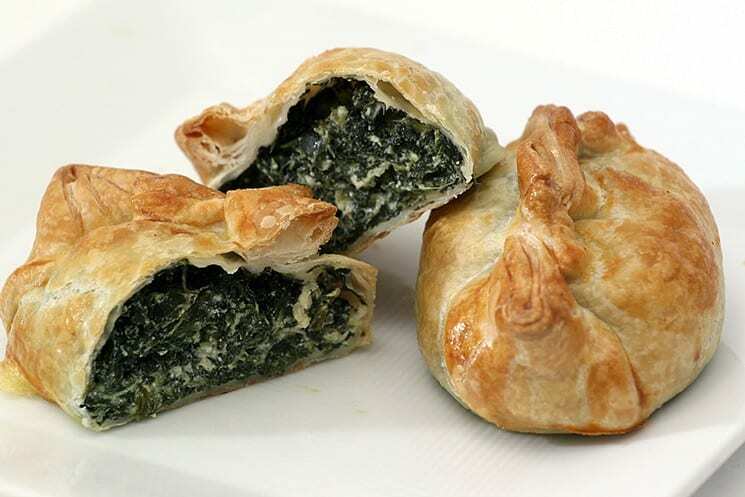 Filled with spinach, cheese and pine nuts, these are a symphony of textures and flavours. No pine nuts on hand? No probs, you can literally throw any old veggies or grains into them – try quinoa or rice. How French does this dish sound? It would be virtually impossible to compile a list of cheese based dishes without mentioning something French. 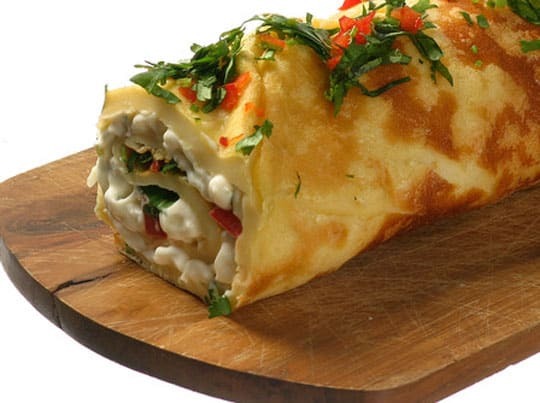 You can sub in any soft cheese you like here (like cottage cheese), but to be honest, there’s something about the combo of eggs and chevre that’s just right. 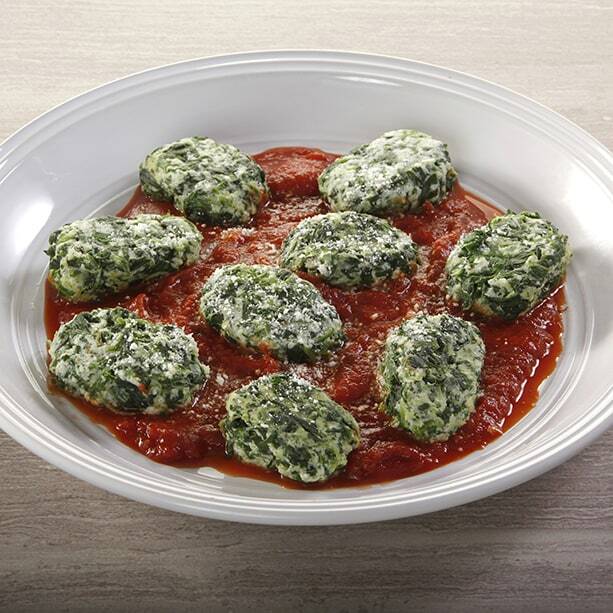 Let’s face it – spinach is bland. 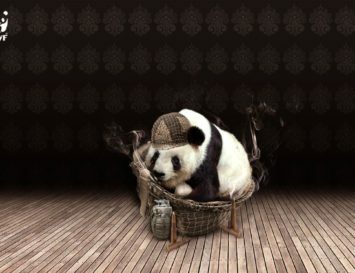 Which is both is strength and weakness – it goes with pretty much everything, but doesn’t taste like much. Enter watercress, a spicy, peppery green with a lot of character. 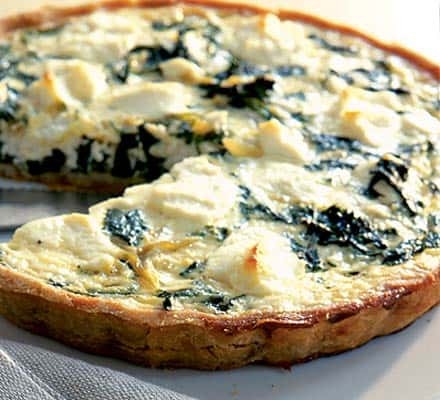 Add some tangy goat cheese, and you’re in tart heaven! I’d recommend a bit of black pepper with this, and maybe a dusting of Parmesan, too. Cauliflower is just miraculous – it’s been used as a carb substitute for everything from rice to pizza bases, and now…bread sticks! These may not be the easiest things to make – the require a food processor, baking and a bit of food prep – but their crunchy, cheesiness is well worth the effort! 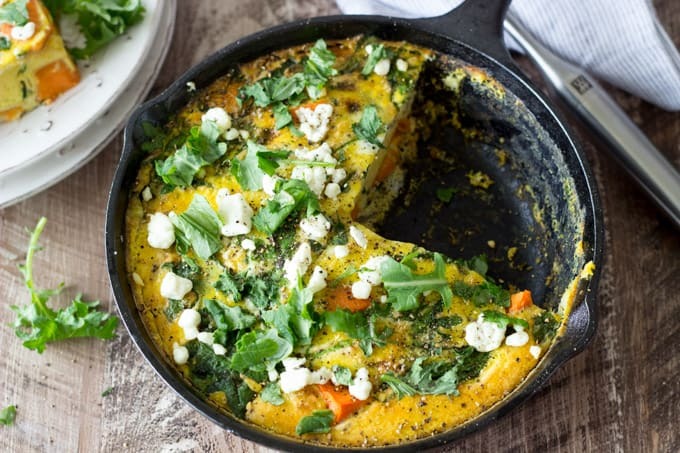 Frittatas are pretty easy to make – all you need to do is whisk some eggs together and and throw your ingredients into a skillet on top of the stove, then cook nice and slow. They’re super delicious and go well with lots of leafy greens. 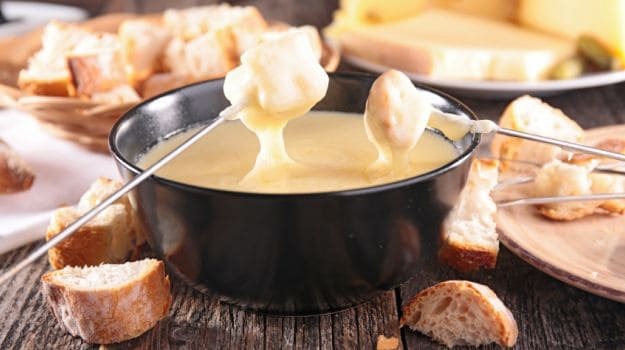 Fondue represents the perfect marriage of wine and cheese. Normally, you would need a special earthenware pot to make this correctly, but a double boiler pot will give you the same effect. 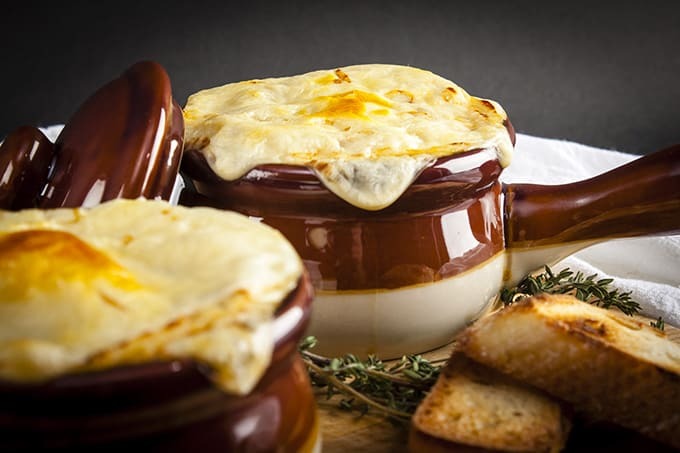 To keep the cheese smooth, you can also serve it in a preheated earthenware dish like the one below (use the microwave, but be careful not to touch it), or set the dish atop a slightly smaller pot, with a tea candle burning inside. If you don’t have fondue forks, bamboo skewers or normal forks will have to do. The best part if the recipe is pretty easy to make, and all you need to do is find lots of things you’d like to dip into it. Think chunks of fresh bread, chopped cooked veggies, or crudites. Who doesn’t love cheesecake? With so many various flavours on hand, the options are truly endless. But one of my go-to faves is lemon. It’s always so refreshing on the palate after a meal, and here, the creme brulee topping gives it a nice, golden crunch. Did you know that ‘Tira mi su’ in Italian means ‘lift me up’? 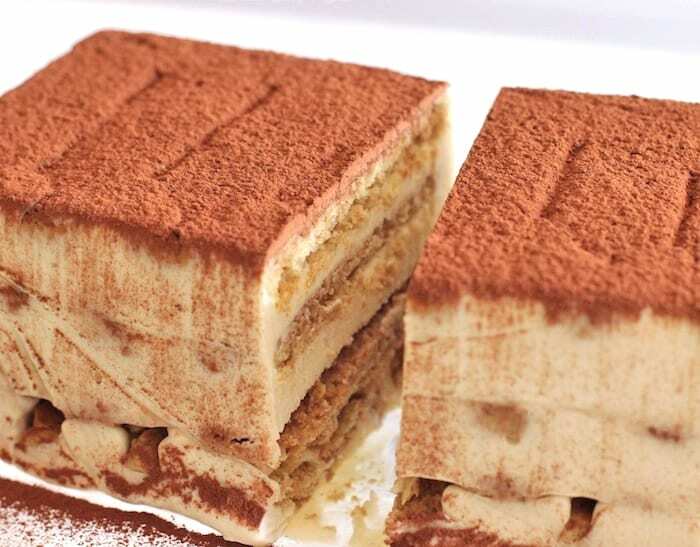 The dessert is so named thanks to the lashings of rum and coffee in this Marscapone based dessert. 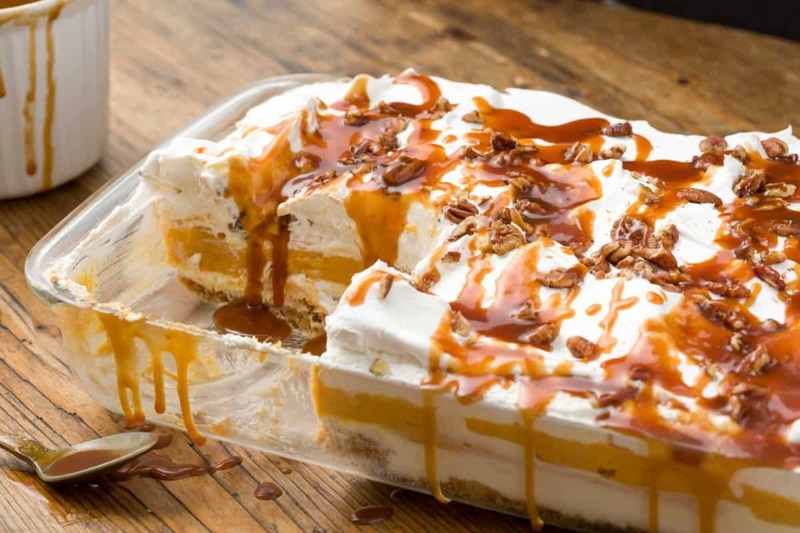 This may not be the fastest thing to make, but it’s pretty much guaranteed that after eating it, you’ll be on a dessert high! Eastern European classic, baked ricotta cheesecake is far lighter than its cream cheese based American cousin. Lower in calories, too! It’s traditionally served with a few raisins in it, and it’s not very sweet. Frankly, I love it! But some claim it can be a bit dry. 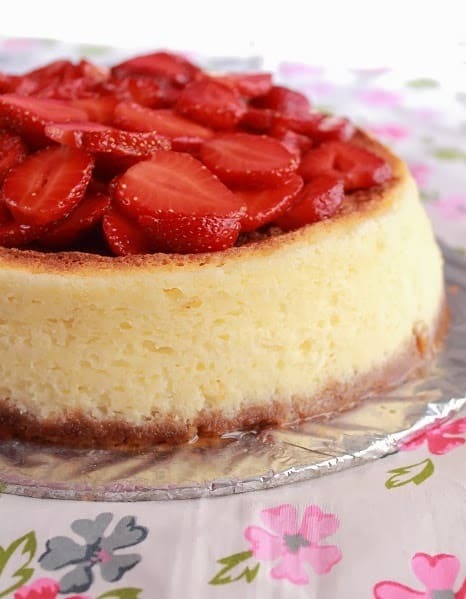 For that reason, this recipe uses some cream cheese, and strawberries, too. Not very trad, but pretty, isn’t it? How could I not finish this off with this bad boy of a recipe? Seriously, just take a look at this and try not to drool. It’s like climbing a mountain of pure sweet, sticky goodness. Okay, I’ll stop gushing now, but if there’s a more perfect cheesecake recipe for fall than one with pumpkin, give me a call. Topped with toffee sauce and sticky pecans . . . I’m literally in dessert heaven.